ad broad: this is the band kids are crazy about? 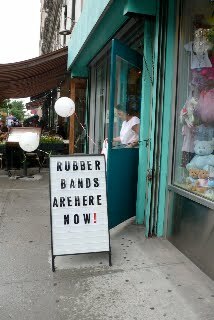 But they're not just circular rubber bands - when they aren't stretched out on your wrist, they are shaped like animals, hearts, stars, and other things. Don't get me wrong, the fact that they are so "hot" confounds me. These things are pretty nuts and I'm find that stores are having trouble keeping the originals in stock..Now I see they have logo bandz such as Disney, NFL, NBA, MLB, etc.